Josiah Reynolds is a beekeeper trying to stay financially afloat by selling honey at the Farmers’ Market. She finds her world turned upside down when a man is found dead in her beeyard, only to discover that the victim is her nemesis. 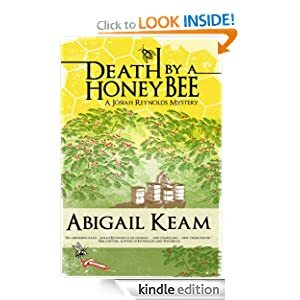 Well written cozy mystery set in the deep countryside of a beekeeper, with a famous ex-husband and a vast land-rich estate that left her cash-poor. Abigail does a great job setting up Josiah’s estate, her farmer’s market and honey stand, though she leaves the particulars about honey farming a bit thin. If Josiah is this big all-time bee keeper and honey expert, there should be more of it running through Josiah’s life, not left to the efforts of her gay graduate assistant who she is pining for (cliche, though). The rhyme and meter of the book is well-placed, there aren’t any areas where it drags, the minor characters even are three dimensional as Josiah. Each is shown having foibles, strengths, as any person is. The plot itself is thought out very well, as Abigail had thought of every possible loophole in this country cozy mystery. Abigail also uses the minor characters ingeniously enough without being desperate as many writers cause impossible scenes that could not play out in real life. What I love is you don’t have to suspend belief in reality to read Death by a Honey Bee. I would give four stars. ← How about the Seahawks Superbowl Winners!